Cooking with beer adds terrific flavor to any meal, and it makes this Black Ale Marinated Spatchcocked Chicken super juicy and golden. I can tell that summer is fast approaching because we have grilled this week at least three times. My husband is usually in charge of this, so after the third night of grilling he seemed annoyed. “Again?” he asked. I didn’t remind him that I have dinner duty 7 times a week. I deliberately take Saturday night off, but then there’s the family dinner party or something else that I find myself cooking for. But, nevertheless, I’m excited to take the kitchen outside, if you know what I mean! Sometimes products get passed on to me to develop recipes with. I don’t do this very often, unless I really like the product, company or challenge presented to me. This time, through the Foodbuzz Tastemaker Program, I was asked to create a dish that either features or pairs well with a New Belgium Brewing Company beer. I admit that I am not a beer drinker, nor a big wine drinker. My hubby is both. But, I love to cook with both. The alcohol is burned off in the cooking process and you are left with a dish that is very flavorful and safe for the kids to eat! Now I may not like drinking beer but I do love cooking with! I love cooking with beer because of the unique flavor it brings to my meal. And this black ale really was a wonderful flavor enhancer for my chicken. This time I butterflied a whole roast chicken, a.k.a. spatchcocking, and marinated it for 6 hours in a mixture of New Belgium Brewing Company’s 1554 Black Ale, onions, garlic, mustard and spices. The beer really makes this chicken juicy. 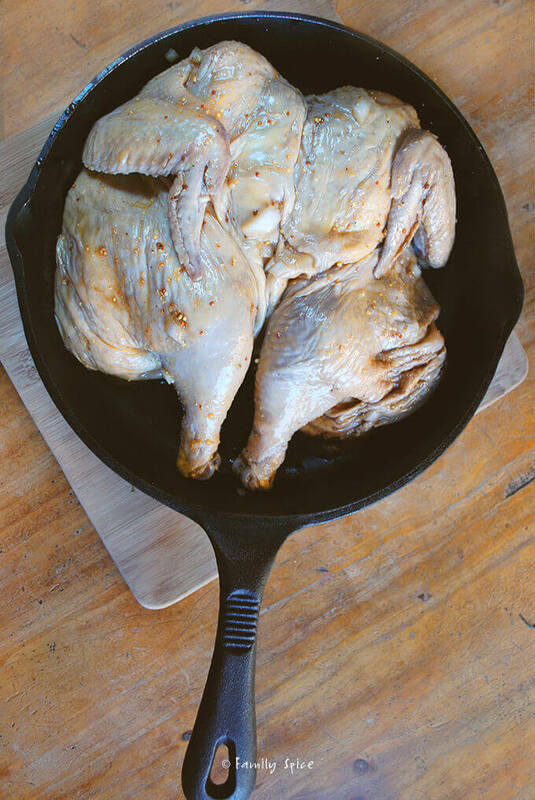 I placed the chicken breast side up in my cast-iron skillet and roasted it for 45 minutes at 425ºF. I originally wanted to grill it, but the hubby gave me the evil eye when I hinted about lighting up the fire. Okay, he can have a night off. The Black Ale Marinated Spatchcocked Chicken was amazing. There was no overt beer after taste, but it was super juicy and delicious. And my kitchen had this amazing sweet aroma while the chicken quietly roasted in the oven. Super Easy. Super Delicious. If the giblet and neck are in the chicken cavity, remove them and reserve for another use or discard. Place the chicken, breast side down, on a cutting board. Using poultry shears or a large, sharp knife, cut along each side of the backbone. Pull the chicken open slightly to cut the backbone out completely. Reserve for stock or discard. Turn the chicken breast side up and open it as flat as possible. Press down firmly to break the breastbone and flatten the bird. Rinse the chicken and pat it dry with paper towels. 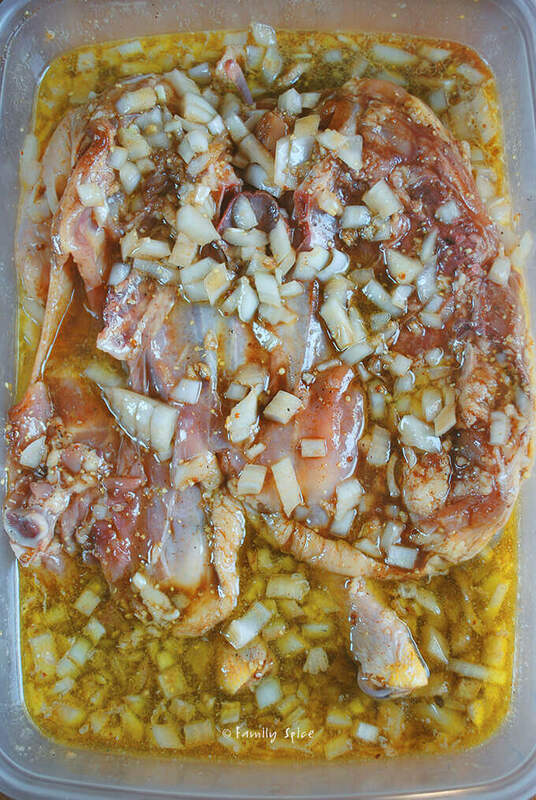 Place butterflied chicken in to the marinade and coat both sides. 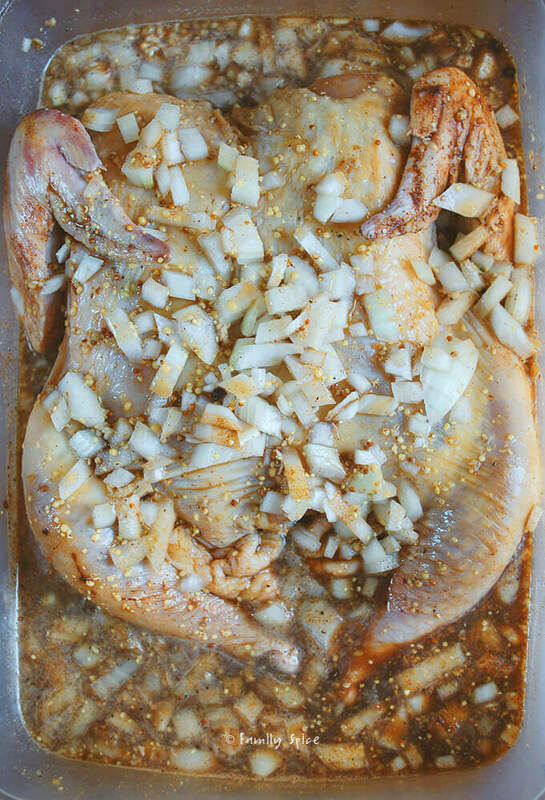 Cover and refrigerate 5-6 hours, flipping chicken over to marinate evenly. 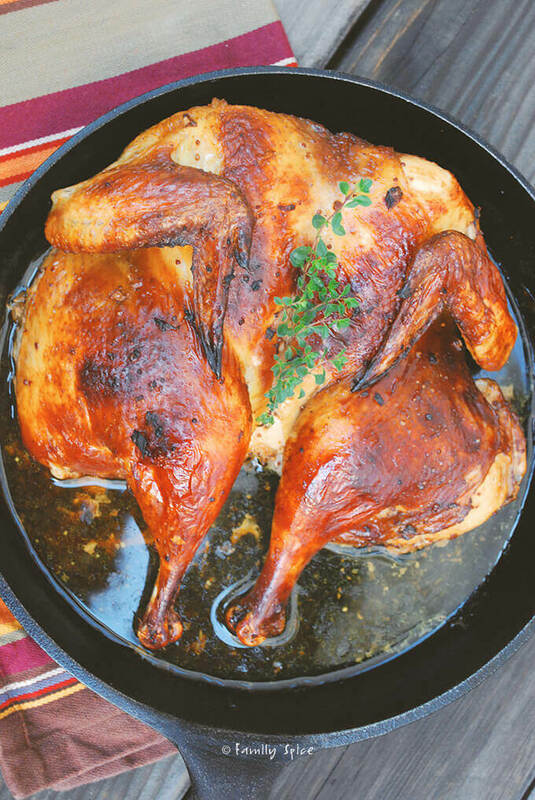 Remove chicken from the refrigerator 30 minutes prior to roasting. Preheat oven to 425ºF and place chicken in a large cast-iron skillet, breast side up. Roast chicken for 45 minutes, or until a meat thermometer inserted into the thickest part of the thigh away from the bone registers 170º-175ºF. If chicken starts to burn, loosely cover with a sheet of aluminum foil. Remove from oven and let chicken sit for 5-7 minutes, then serve. Cooking Tips: Also great on the grill! Grill the chicken bone side down over medium-high direct heat in a covered grill for ten minutes. Flip the chicken over and grill the chicken over direct heat for an additional ten minutes Be careful so that it doesn't burn. Reduce heat slightly, if necesary. With a meat thermometer, check the temperature of the breast. If it hasn't reached 165ºF, move the chicken to grill over indirect heat, skin side up, until it's done. Remove the chicken and let it rest, covered loosely with foil, for ten minutes prior to serving. Whoa. Look at that chicken!!! OK, I love Fat Tire. This is soooo beautiful. Printing! May I just say,that I truly applaud your beer choice (Fat Tire). Love it! And that chicken picture took my breath away. It looks so good. We would be grilling about now, but our propane tank is empty. I.e. we are being very, very lazy. I have to admit that this has been the best looking roasted chicken I have ever made! Gotta love the cast iron skillet, too! 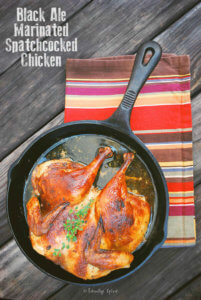 This sounds great- might be tempted to try with a cornish hen and do it in my panini maker! That chicken looks magnificent! Fantastic colouring. I think it's good you let the hubby off for this one. Cooking a whole chicken on the BBQ can be quite time consuming if you are constantly having to check it. I'm always worried if the grill is hot enough and it's not as exact as an oven. At least with the oven, you can go and do something else for 45 minutes. Good tip to grilling a whole chicken: Light one side of the grill, put the chicken on the other. How did I miss this post?! That chicken looks amazing!!! I cook with wine a lot, but never beer. 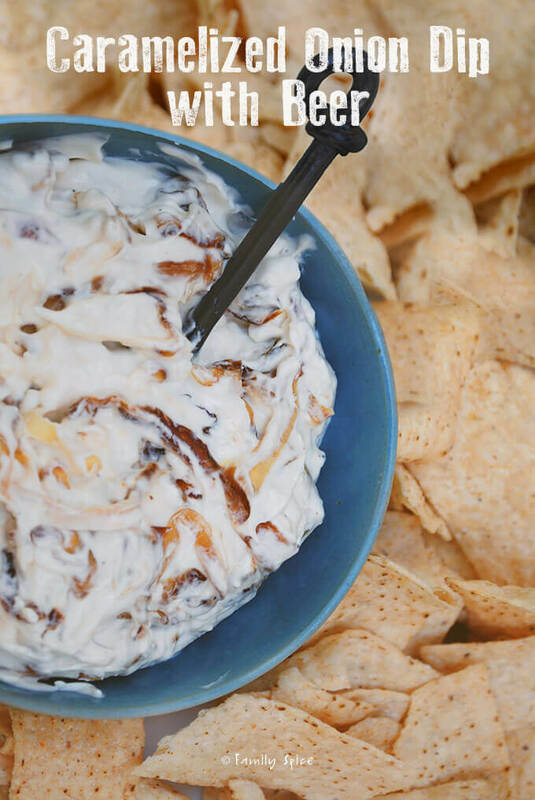 My husband will be sooo happy about this recipe idea! He calls himself a "beer connoisseur" – he is actually the one who made me a snob about beers! Thank you, as ALWAYS, for such great inspiration, Laura. 🙂 I'll be making this on Saturday! Can I tell you how my mouth is watering when I look at your chicken? :)) Sooo good! 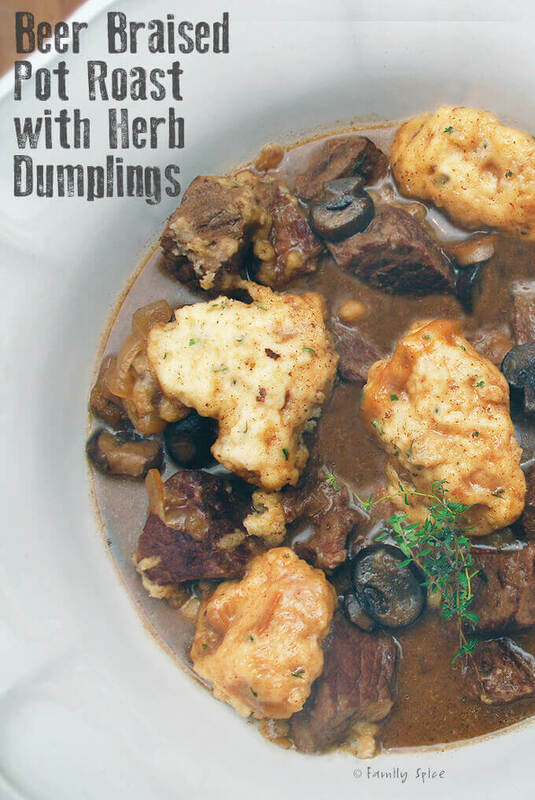 I love cooking with beer and this recipe looks so good! Great photos. So glad to have found you through YBR. Thanks, everyone. 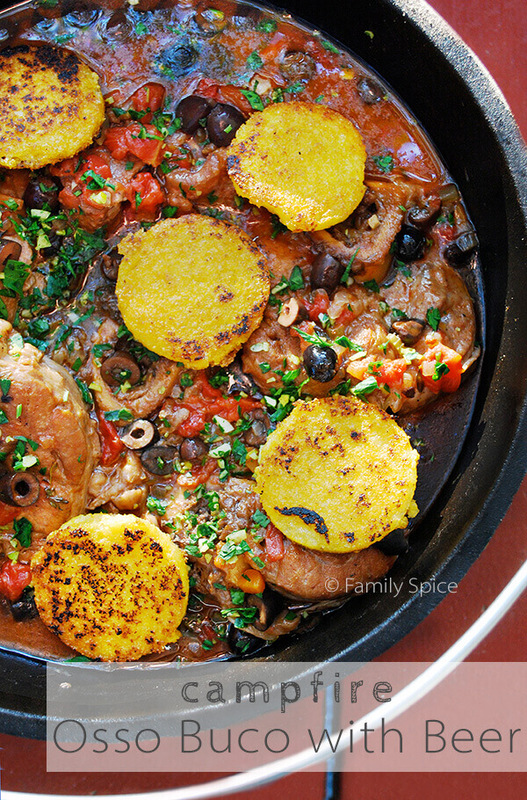 I hope you give this recipe a try and let me know how it turns out!